We're now pausing our live coverage, but you can keep up to date with our news stories, video and background briefings on the BBC news website. Museums in the Australian state of Victoria tweeted this image of Notre-Dame from a century ago. In a tweet, King Felipe VI of Spain has said "the world is and will be with France" in the aftermath of tonight's fire. Here's a look at the section of the cathedral that has been destroyed by the fire. French billionaire François-Henri Pinault, chairman and CEO of the Kering luxury group, has pledged €100m (£86m; $113m) towards rebuilding Notre-Dame, according to a statement quoted by AFP news agency. Earlier, President Emmanuel Macron vowed to launch an international fundraising scheme to rebuild the cathedral. Kering owns the Gucci and Yves Saint Laurent fashion brands. As the wooden rafters burned, the roof, a spire, and much of the cathedral's interior were destroyed. But some parts of the 850-year-old Gothic building have also been saved. From rose windows to gargoyles, from bells to relics, we look at what makes the Notre-Dame cathedral so special. What is it about the cathedral that makes it stand out? "Notre-Dame is our history, our literature, part of our psyche, the place of all our great events, our epidemics, our wars... the epicentre of our lives. "Notre-Dame is burning, and I know the sadness, and this tremor felt by so many fellow French people. But tonight, I'd like to speak of hope too. "Let's be proud, because we built this cathedral more than 800 years ago, we've built it and, throughout the centuries, let it grow, and improved it. "So I solemnly say tonight: we will rebuild it together." Images have emerged showing a different view of the damage caused to the cathedral - including a hole reportedly beneath where the spire was positioned. 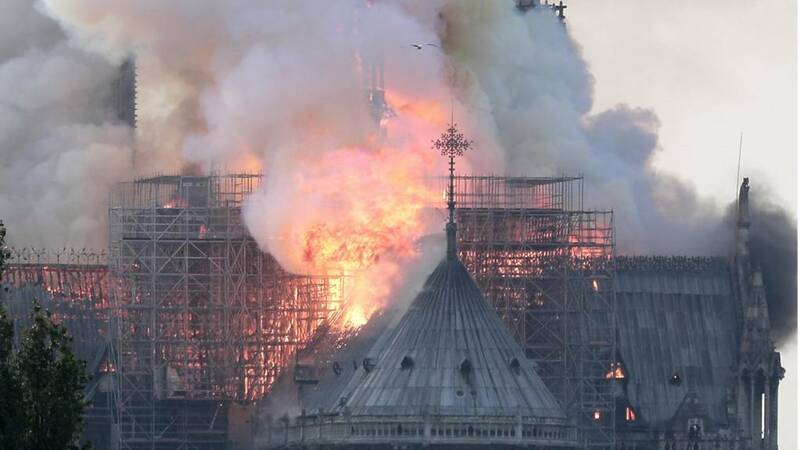 The BBC's Neil Henderson has also been sharing some of tomorrow's French and British newspaper front pages on social media - with the Notre-Dame blaze dominating the news agenda. La Croix, a French Roman Catholic newspaper, has released images of its front page for Tuesday. Former French President Nicolas Sarkozy tweeted to say that France was "touched in its heart, in its identity, in its history". Further to its earlier announcement, the office says it is investigating "accidental destruction by fire". Mr Macron also expressed sympathy towards Catholics around the world. "What's happened this evening is obviously a terrible drama," he said. "[Emergency services fought the fire] with extreme courage, professionalism and determination... I would like to thank them on behalf of the entire nation. "This is our history, and it's burning." Speaking at the scene in Paris, President Macron called the fire a "terrible tragedy", but added that the worst had been avoided. He said he planned to launch a fundraising campaign to renovate the cathedral.